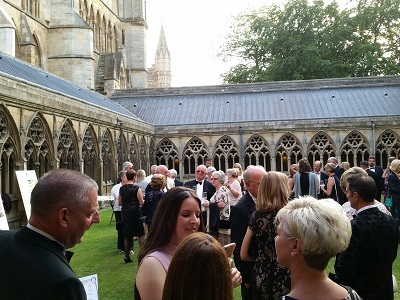 An evening enjoying a number of German wines interspersed with a selection of canapés created to balance the taste of the wine was held in the magnificent cloisters of Lincoln Cathedral. 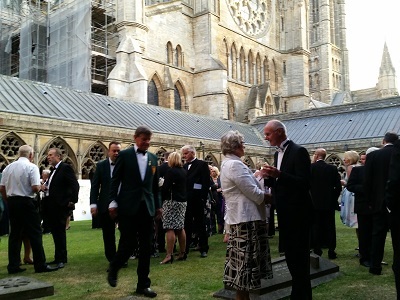 The evening arranged by the Lincoln Section of FFN ((Feucht Fröhliche Neustadter) and the Rotary Club of Lincoln. Paul Brewer acted as the master of ceremonies and introduced each of the wines. The proceeds will be donated to Rotary and FFN charities. The magnificence of the setting and the ideal weather complimented the wine and food to produce an ideal event.